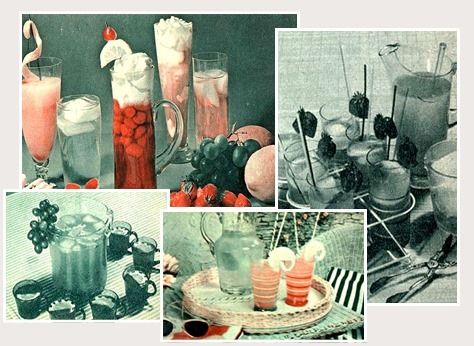 Featured drinks are Danish Major, Ice Cold Fruit Cocktail, Melon & Cherry Delight, Cherry Cobbler and Twilight Bonfire Bowl. ”Alle Kvinners Blad” was started in 1938 . It changed its name to “Alle Kvinner” in 1974 and threw in the towel in 1978 . It was a very popular magazine and among the largest in the 1950s. It was published by Gyldendal. Among those who have been editors is Toppen Bech who was editor from 1974 to 1978. 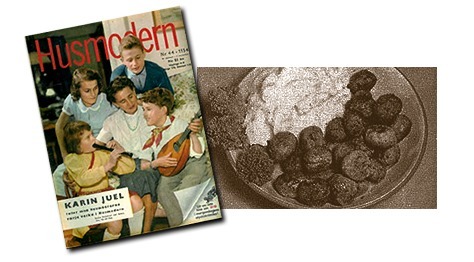 This recipe is taken from the Swedish magazine "Husmoderen" (The Housewife) - No 7 – 1959. A banana is an edible fruit produced by several kinds of large herbaceous flowering plants in the genus Musa. (In some countries, bananas used for cooking may be called plantains.) The fruit is variable in size, colour and firmness, but is usually elongated and curved, with soft flesh rich in starch covered with a rind which may be green, yellow, red, purple, or brown when ripe. The fruits grow in clusters hanging from the top of the plant. Almost all modern edible parthenocarpic (seedless) bananas come from two wild species – Musa acuminata and Musa balbisiana. The scientific names of most cultivated bananas are Musa acuminata, Musa balbisiana, and Musa ×paradisiaca for the hybrid Musa acuminata × M. balbisiana, depending on their genomic constitution. The old scientific name Musa sapientum is no longer used. 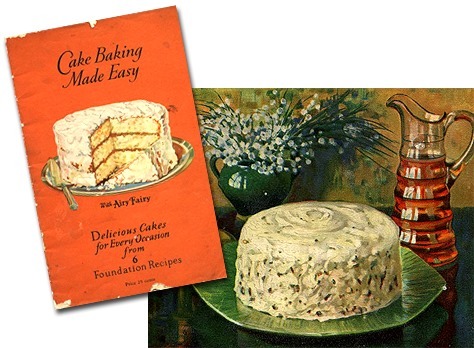 The recipe on the page won first prize at the Texas-Oklahoma Fair at Wichita Falls, Texas in 1925. It was presented by Mrs. J C Cotton of 2325 Reuter St. Waco Texas. 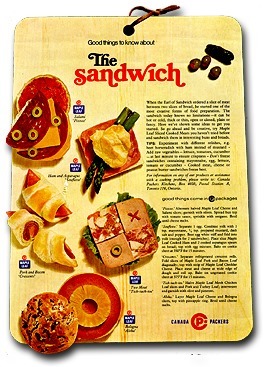 From the ad: Such delights you can serve … such fun creating deliciously different sandwiches. It’s so easy with your baker’s wonderful variety of exciting breads=-like French, Rye, Enriched White, Whole Wheat and Raisin. They give sandwiches a flavour-lift that’s bound to be remembered. 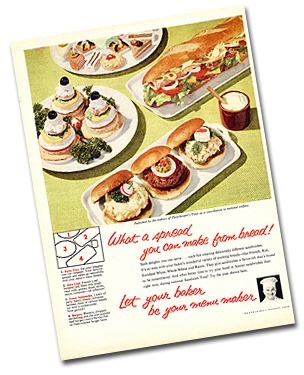 And what better time to try your hand at fancier sandwiches than right now, during national Sandwich Time? Try the ones shown in these recipes. The term "butter cake" is applied to any cake containing shortening, whether or not the shortening is butter. Combine ingredients except cabbage in advance. Just before serving ad cabbage and chips. 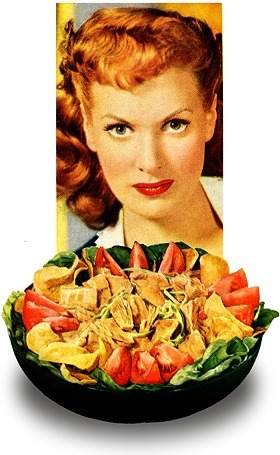 The salad bowl is a charming gesture of hospitality. The orange (specifically, the sweet orange) is the fruit of the citrus species Citrus × ​sinensis in the family Rutaceae. The fruit of the Citrus sinensis is called sweet orange to distinguish it from that of the Citrus aurantium, the bitter orange. The orange is a hybrid, possibly between pomelo (Citrus maxima) and mandarin (Citrus reticulata), cultivated since ancient times. Probably originating in Southeast Asia, oranges were already cultivated in China as far back as 2500 BC. Arabo-phone peoples popularized sour citrus and oranges in Europe; Spaniards introduced the sweet orange to the American continent in the mid-1500s. When the Earl of Sandwich ordered a slice of meat between two slices of bread, he started one of the most creative forms of food preparation. The sandwich today knows no limitations -it can be hot or cold, thick or thin, open or closed, plain or fancy. Here we’ve shown some ideas to get you started. So go ahead and be creative, try Maple Leaf Sliced Cooked Meats you haven’t tried before and sandwich them in interesting buns and breads. From the ad: Here’s a simple but sophisticated main-dish … a savoury bacon-cheese custard pie! Actually, this is a celebrated French dish called "Quiche Lorraine" (pronounced "Keesh lorrayne" ). Our adaptation of it looks wonderfully professional but, as the recipe will show you, is very easy. 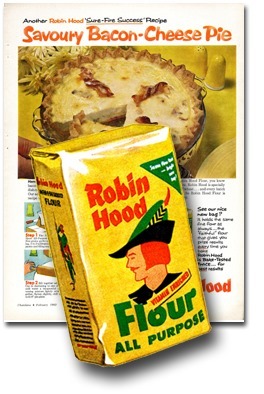 And when you bake it with Robin Hood Flour, you know it will come out just like the picture. Robin Hood is specially milled from the nutritious hearts of wheat … and every batch is bake-tested before it’s ever sold. So Robin Hood Flour is extra-good … in every possible way. 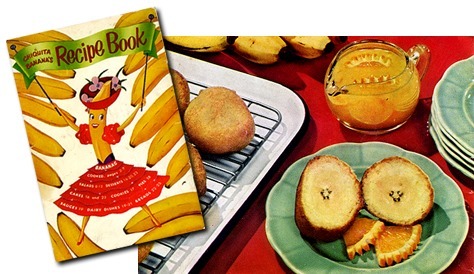 If you got a bamboo covered bar, and the whole room filled with pictures of hoola-hoola babes, ethnic Caribbean masks and stuff, this is the recipes for you. Hersey Chocolate Corporation published this promotion booklet in 1937. You can see the cover page above, two kids stuffing themselves with chocolate cake. 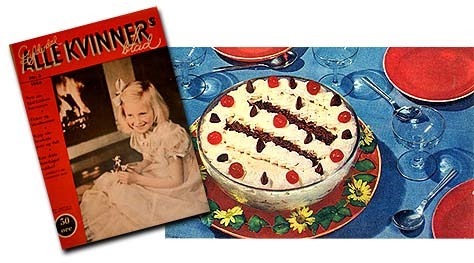 I find it hard to believe that kids were allowed to attack a cake like that back then, but I guess that’s beside the point ;-). 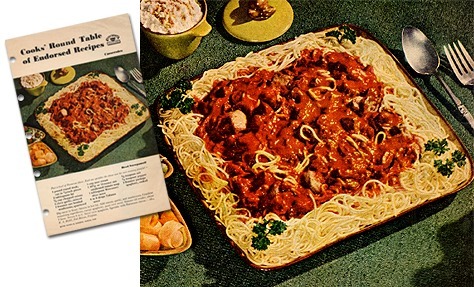 This is one of my favourite recipes from the booklet. I never miss a jumble sale and here in Norway there are a multitude of them in spring and autumn, usually held at schools and the earnings go to the school’s bras band. What I look for is as you might have guessed old cook books and recipe collections. 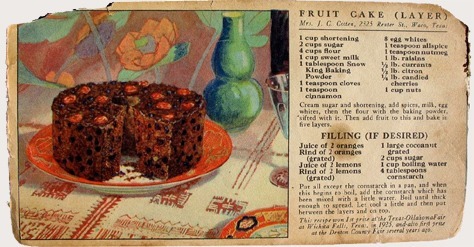 This recipe comes from such a collection and it was sent to Better Homes & Gardens Magazine by Mrs. E. A. Bedell from Fort Belvoir in Virginia sometimes in 1949.